The sole target of every blogger or web developer is to build a successful and trending blog or website. But before you can create or build a successful website that will boom as you desire, there are some tips you need to know, understand and apply. 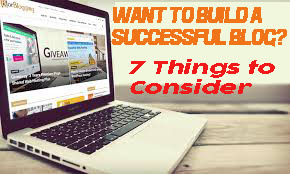 In this tutorial article, I will explain some of these success tips especially for bloggers and some things you must consider before creating a successful blog or website. I will also reveal how to boost your site traffic for free. Here are some of the things that determines how successful your blog or website will be. Therefore, you need to put them into consideration before you even start creating a blog or website. Now, I will elaborate each of these tips. Let’s get started! This is the first and foremost thing to consider because it will also help you to make the right choice for the subsequent listed tips above. You must first conclude to build a blog or website on a particular niche. Niche is the category of information you intend to provide on your blog/website. In order to create a successful blog, you must first choose a trending niche and also have passion for that niche. Some of the trending unsaturated niches/categories are: Fashion, Health and fitness, Online food recipes, Sports and gaming, etc. Most people don’t succeed in blogging because they chose the wrong niche or because they don’t have passion for the niche they chose. Don’t choose a niche just because you have passion for the niche. Don’t open a blog and start writing the story of your life unless you just want to blog for fun! You might find it very difficult to succeed if the niche is already saturated. Also, a niche might be trending but is already saturated because many people blog on the niche. A new blog might find it difficult to gain fame, grow or become noticed in such a niche. Imagine a new blog that is in the same niche with Microsoft website. Imagine how many years it might take it to gain fame and how far it fame will go! Some of the trending saturated niches are: entertainment and celebrity news, tutorials, etc. Don’t try to combine so many niches in one website. You can combine about 3 similar niches. But if possible, maintain one niche. It helps your site to gain fame faster. Once you have decided and concluded on the category of your blog, the next thing to consider is the design platform of your blog or website. By design platform, I mean where you will host your website and the script language to use. For a blog, the 2 most popular platforms are blogger and wordpress. Blogger.com is a free platform provided by Google to help those who have the passion to own a blog but don’t have the money or the knowledge of how to code or build a website from scratch. One of the advantages of this platform is that you don’t need to buy a hosting. Google hosts your blog for free.. in order to use or create a blog on blogger, you must have an active gmail account. You can always create one for free at gmail.com. Blogger offers a free “.blospot.com” domain name extension. But you can always buy and use a custom domain name which does not include the “.blogspot”. The second popular platform for a blog is wordpress. Wordpress is a free Content Management System (CMS). It also offers a free”.wordpress.com” free domain name extension you can use until you decide to buy a custom domain name for your blog. It can also be used to create a full complex website, unlike blogger. Another advantage that wordpress site have over blogger sites is that that there many wordpress plugins that help you setup or manage your blog or website. One of the disadvantages of wordpress CMS over blogger is that you must buy a hosting plan before you can use a custom domain name. The domain registrar I recommend for you is godaddy.com. They have many packages that suits your plan.Before you decide to host your site with a hosting company, first check the features available in the hosting plan you are opting for especially the band width. Go for a plan that as high band width if you are planning to build a huge website with many media like movie, audio, etc. When you have decide on the design platform and scripting language to use, the next important thing to consider is to choose a good domain name. A domain name is a unique URL that directs people to your website or blog when they type it in a web browser. For example, the domain name for this website is www.techtimes.com.ng Domain names are usually renewed annually. There are other available domain extensions apart from “.com” such as “.net”, “.edu”, “.org”, “.info”, etc. Choose a name that will be easier to remember. How user-friendly it is, especially in its mobile view because up to 80% of traffic these days come from mobile phone users. The colour combinations used in the template. There are many templates available, both free and paid (premium) versions offered by many websites. The website I recommend is soratemplates.com. They have user friendly and SEO friendly blog templates. You can also design your website or template from scratch if you are good in web development.